Abound Solar received $70 million in loans from the Department of Energy. NEW YORK (CNNMoney) -- Abound Solar announced plans Thursday to file for bankruptcy and suspend operations, becoming the industry's latest government-backed firm to close its doors. The solar-panel manufacturer was approved for a $400 million loan guarantee by the Department of Energy in 2010, though the Department ultimately lent the company only $70 million. In a blog post on Thursday, DoE spokesman Damien LaVera wrote that because of "the strong protections we put in place for taxpayers," the government's loss on the Abound loan likely won't be more than $60 million once the liquidation process is complete. "While disappointing, this outcome reflects the basic fact that investing in innovative companies -- as Congress intended the Department to do when it established the program -- carries some risk," LaVera wrote. Abound's bankruptcy follows last year's high-profile failure of Solyndra, which went bust after receiving a $535 million loan guarantee from the Energy Department in 2009. Beacon Power, which made energy storage devices, also filed for bankruptcy last year after receiving a DoE loan, costing the government $12 million. Two other DOE-funded companies have also had trouble -- Ener1 and Fisker -- though they received grants and are not in the loan program. Abound's bankruptcy comes amid an escalating dispute between the U.S. and China over solar-panel manufacturing. Last month, the Commerce Department imposed stiff tariffs on Chinese-made panels, accusing producers of "dumping" their products on the American market below production costs. 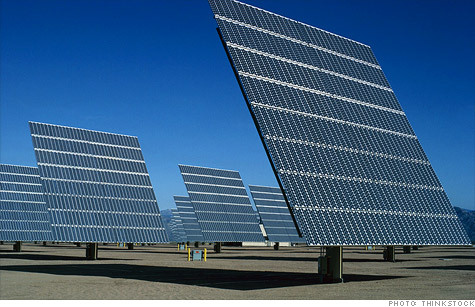 U.S.-based manufacturers like Solyndra and First Solar (FSLR) have suffered from the resulting plunge in panel prices. Abound said in a statement Thursday that its panels had the potential to achieve a lower cost-per-watt than those from its Chinese competition, but said these firms' "aggressive pricing actions" made it difficult to compete. Some 125 employees will lose their jobs as a result of the bankruptcy.